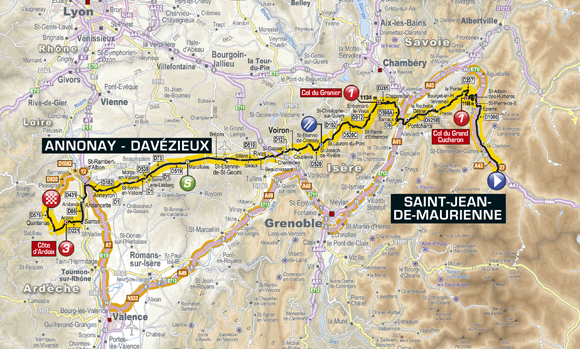 We’re in Saint-Jean-de-Maurienne as the race heads westwards to the Ardèche on the longest stage of this year’s Tour. Au revoir to the mountains, though not without a few decent-sized Chartreuse Alps to cheese off sandbagging sprinters. Phew, those first 80 kilometres aren’t going to be easy. Once the unpleasantries – the Col du Grand-Cucheron and Granier – are over, it’s a long, mainly downhill run on heavy roads into the Rhône valley. 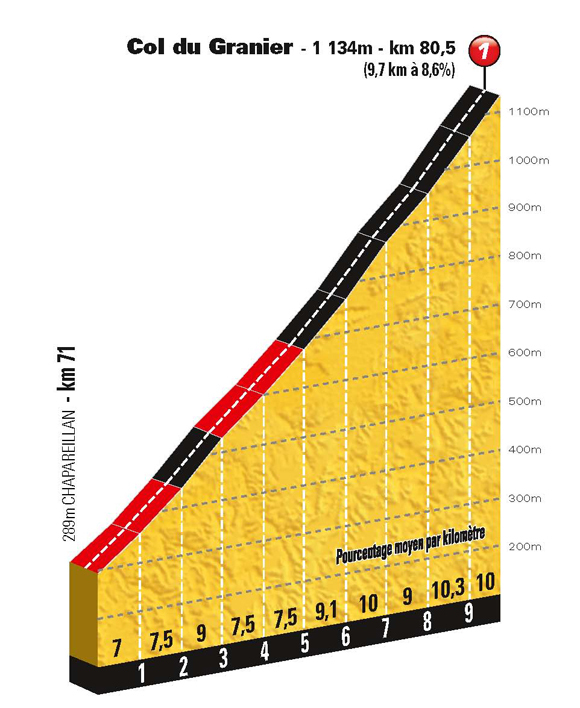 Then it gets uppity again: the third-category Cote d’Ardoix, twenty kilometres from the finish, and a sharp little climb between four and one kilometres from the finish will contribute to the entertainment. There’s no such thing as an easy transition stage at the Tour. It’s Friday the 13th, for the longest, and one of the most unpleasant stages of the Tour. What can possibly go wrong? 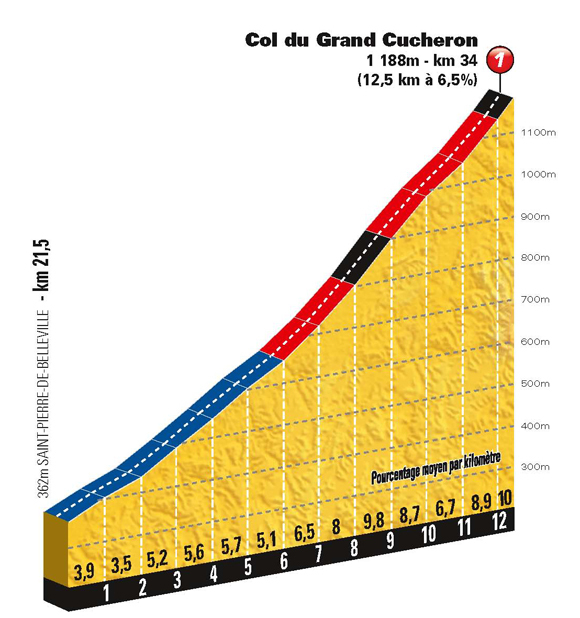 This is ideal fodder for a big, well-represented breakaway to sort it all out between them, while everybody else taps through the stage together, hoping that Frank Schleck isn’t going to get perky on the climbs. Duck breast and Picodon cheese. The final 20 kilometres is where the break will start to lose cohesion. “The Ardèche is a wild region – not many big towns or big roads. But it’s a very good region for cycling, and France’s biggest sportive, the Ardèchoise, takes place nearby. Thousands of cyclists come every year to take part in it. “The roads are good for cycling in some ways – they are quiet, twisting and narrow, so it’s very varied. It’s also very hard – the road surface is more gravelly, and less smooth, so it’s very sticky to ride on. And you are always climbing or descending. The hard thing is the constant repetition of climbing. It also gets very hot. “I haven’t ridden the Tour de France yet, and having done the Giro d’Italia this year, I don’t think I will be in the Tour team. But it’s the biggest race in the world and I hope I get a chance to ride it. – Annonay Davézieux hosts the Tour de France for the first time. – At 226 kilometres, this is the longest stage of the Tour. It’s the equivalent of 35.3 Liège Prologues laid end to end. – Apart from 2009, which had a longest stage of 224 kilometres, this is the shortest longest stage in Tour history. – Since 1990, which featured the last ever stage over 300 kilometres (301 to Rennes), the longest stage has been getting shorter and shorter. There hasn’t been a stage above 250 kilometres since 1998, and no stage above 230 kilometres since 2008.